Here are some of the beautiful open star clusters which grace the autumn skies. TheThanksgiving holiday inthe United States is a great time to gaze at the many brilliant openstarclusters that grace the late autumn skies in the Northern Hemisphere. TheMilky Way rises abovethe eastern horizon, laced with the finest clusters visible to thenaked eye,binoculars, or small telescopes. Thebrightest of all starclusters ? in fact, the brightest deep sky object in the entire sky ?is thePleiades, also known as the Seven Sisters, or, in Japanese,"Subaru." Yes,the Japanese carmanufacturer is named for this famous star cluster, as is the giantJapanesetelescope atop Mauna Kea in Hawaii. The Pleiades consists of about 800brightyoung stars, with a surprising number of older white dwarf stars mixedin. 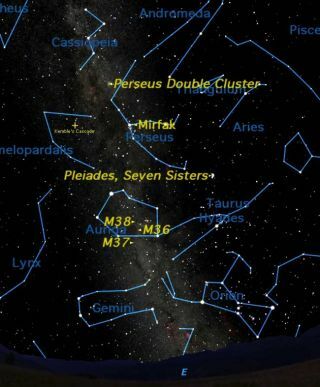 Thissky map shows how to spot the Pleiadesin the night sky. ThePleiades is bright fortwo reasons: its relatively young age and its close distance to us,approximately 410 light-years. Thestar cluster's brightnessof 1.2 magnitude places it among the 20 brightest objects in the sky,easilyseen without aid. Astronomers measure the brightness of objects asmagnitude.The lower the magnitude number, the brighter an object is. Howmany stars can you seein the Pleiades with the naked eye? Althoughthe name "theSevenSisters" suggests seven stars are visible, most people cansee onlysix. (The Subaru automobile logo shows six stars.) Even the smallestbinocularswill reveal dozens more. Ifyou are graced withreally dark skies, you even may see the faint wisps of the gas and dustthatsurround these stars. ThePleiades is only one ofmany rich open clusters in this part of the sky. Openclusters arerelatively small groups of relatively young stars embedded in the MilkyWay galaxy,in contrast to globular star clusters, which are much larger groups ofvery oldstars in orbit around the centerof the Milky Way. Justbelow the Pleiades,still in the constellation of Taurus, is a closer and more scatteredcluster,the Hyades. Only 150 light-years away, this is the closest star clusterto the sun. Thebright red giant starAldebaran appears to be part of this cluster, but in fact it is muchcloser tous, only 65 light-years away, so its presence in the Hyades is just anaccidentof perspective. Manyof the stars that makeup the constellation of Perseus, just above Taurus, are members ofanother starcluster, named after its brightest star, Alpha Persei (also calledMirfak). At600 light-years away,the Perseus Moving Cluster is slightly farther away from us than thePleiadesor Hyades. It?s called a "moving cluster" because its stars share acommon motion across our sky. The Hyades is also a moving cluster, butthePleiades is not. Allthe nearby star clustersmentioned so far are best viewed with the naked eye or low-powerbinoculars.The remaining clusters in this area are best appreciated through binocularsor a small telescope. ThePerseus Double Cluster,located halfway between Cassiopeia and Mirfak, is actually two starclusters,located 7,000 and 8,100 light-years away but almost aligned in our lineofsight. The two clusters are very different in the density and color oftheirstars, and make a beautiful contrast on a clearcrisp autumn night. Tothe left of Taurus andbelow Perseus is the rough hexagon of Auriga, dominated by thebrilliant first-magnitudestar Capella. Thisis in one of therichest areas of the Milky Way, abounding with beautiful star clustersbestexplored with a small telescope. Three of the most famous werecataloged bycomet-hunter Charles Messier in September 1764 after being discoveredby Sicilianastronomer Giovanni Battista Hodierna over a century earlier. M36 andM38 areinside the hexagon; M37 just outside. Justto the left of Mirfakand just below Cassiopeia lies a strange constellation with a tonguetwister ofa name: Camelopardalis. This constellation, named after the giraffe,containsno bright stars and is often overlooked by stargazers. Itdoes contain, however,one of the loveliest objects in the sky, Kemble?s Cascade. Thisis not a true starcluster, but rather an asterism ? a grouping of stars that lie in thesamedirection but are not physically connected. It is a chain of about 20stars ofsimilar brightness that seem to tumble across the field of abinocular. It isnamed after its discoverer, Canadian amateur astronomer Father LucianKemble (1922?99). Theobjects described hereare just a jumping-off point for the exploration of one of the richestand mostrewarding areas of the sky. This article wasprovided to SPACE.com by StarryNight Education,the leader in space science curriculum solutions.